The Master Flow 5 in. x 25 ft. 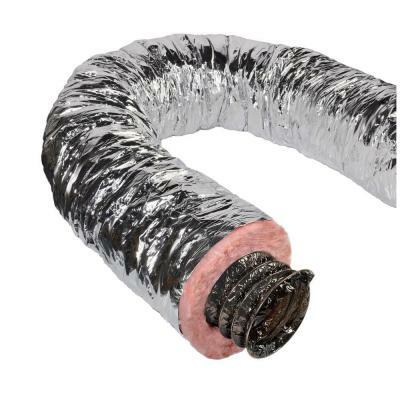 Insulated Flexible Duct R8 Silver Jacket is used in standard Heating and Air Conditioning (HVAC) systems and some venting applications. The duct has R8 insulation which contains 50% more insulation than the standard R4.2 product. This additional insulation provides greater thermal efficiency to save energy. The product is also covered in a heavy duty, silver jacket for durability. The duct is ETL listed, meeting the UL181 standard.